Sheep have their lambs in late winter or early spring as they also need to eat lots of fresh grass so that they can make milk for their lambs. 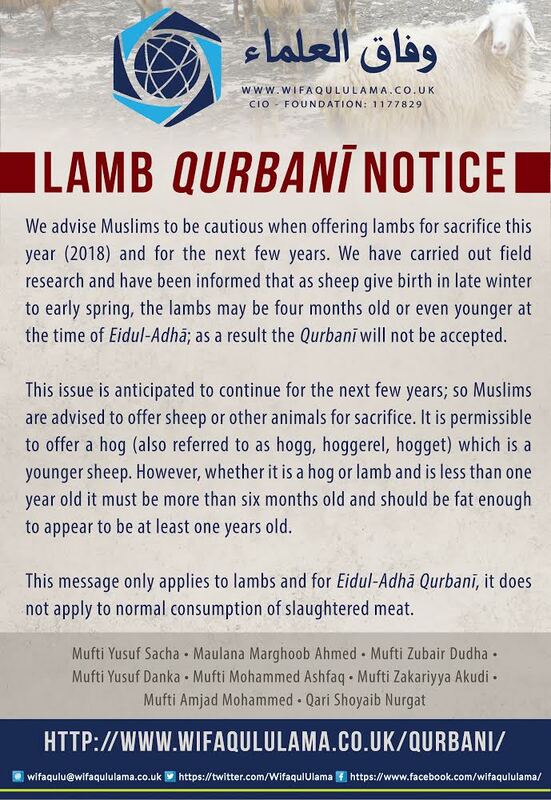 We are expecting Eidul-Adha to be in August in 2018, for the next few years in Britain the natural cycle will mean that (much) younger lambs will be available for Qurbani. Does Islam set a minimum age for the animal to be slaughtered? We advise Mus­lims to be cau­tious when offer­ing lambs for sac­ri­fice this year (2018) and for the next few years. We have car­ried out field research and have been informed that as sheep give birth in late win­ter to ear­ly spring, the lambs may be four months old or even younger at the time of Eidul-Adhā; as a result the Qur­banī will not be accept­ed. This issue is antic­i­pat­ed to con­tin­ue for the next few years; so Mus­lims are advised to offer sheep or oth­er ani­mals for sac­ri­fice. It is per­mis­si­ble to offer a hog (also referred to as hogg, hog­ger­el, hogget) which is a younger sheep. How­ev­er, whether it is a hog or lamb and is less than one year old it must be more than six months old and should be fat enough to appear to be at least one years old.